A new edition of a successful title, which has been fully revised and updated to reflect contemporary issues in curriculum. 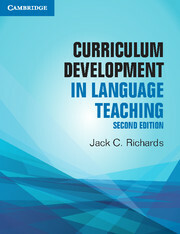 The paperback edition provides a systematic introduction to the issues involved in developing, managing, and evaluating effective second and foreign language programs and teaching materials. Key stages in the curriculum development process are examined, including situation analysis, needs analysis, goal setting, syllabus design, materials development and adaptation, teaching and teacher support, and evaluation. Discussion activities throughout the book enable it to be used as a reference text for teachers and administrators.